I use this flash as my secondary flash. My father has bought this flash in beginning of 80's. The flash has guide number 36 and it has 90º bounce and 360º swivel. Originally it had three color filters and diffuser (for wider flash) and condenser (for more flash power in tele applications). The flash also has secondary smaller flash, which can be turned on and off. In my opinion it has too much power and when I have used it, scenes look like they have been lighted with direct light. Because I get far too many questions about this flash via mail, I had to write FAQ about it. In this FAQ is all I know about this flash and I will not be able to tell you anything more about it via email. And since I don't have manual for this flash I cannot quarantee that this information is 100% correct, but I have taken several hundret photos with different cameras and in different situations successfully. Q: Could you send me a manual of the flash ? Where can I find the manual for this flash ? etc. I don't have manual for this flash and since manufacturing of this flash have been stopped something like 10 year before internet, it's highly unlike that you could find the manual in electronic format unless someone have scanned it. Since the flash is just an basic aperture automatic flash, no manual is not necessarily needed. Just read basic photography books and you will understand how aperture automatic flash operates. Q: How to use the flash in aperture automatic mode ? 3. Set the lower slider of the so that the full circle is at the same ASA number as your film speed. In the photo on this page I have used ASA 50 film (Velvia) and the lower slider is in that setting. 4. Set the camera to use the aperture that the lower slider and the vertical colored lines between the sliders tell you to use. In the example photo I have used Red power lever and ASA 50, and from that information and properly set slider I can see that I have to use aperture F2. If I would have used Green power level, then the aperture would have to be set to F2. - flash has just an idiot circuit, which cuts off the flash after certain amount of light has reflected back to the sensor (in front of the flash naturally). This circuitry is as idiot as central weighted metering in cameras. For example if you are photographing person with bright white shirt, you will propably end up underexposed face. You have to compensate according to the situation and scene. Q: How to use the flash in manual mode ? 3. Set the lower slider according to film speed and power level used. 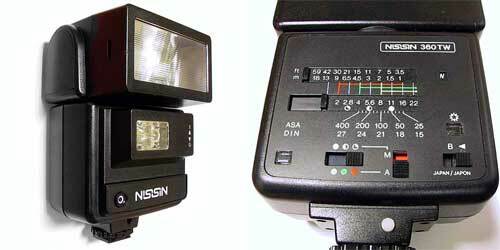 Q: Can I use Nissin 360 TW with camera X ? This flash can be used all cameras, which are able to send the sync signal via hotshoe or via PC-cord (PC is not Personal Computer in this case, it't the normal sync connector, which can be found from most of the cameras). And of course you have to be able to control the exposure manually or atleast the aperture have to be set manually. Nissin has 10 sync voltage and it should not be harmfull to any cameras, I have used Nissin in my G1, which by Canon specs cannot handle more than 6 volts, for thousands of shots. Q: How long batteries will last ? It depends on batteries and how much power you are using. I mostly use low flash power since I use fast lenses with small depth of field. And I also use flash for fill in purposes (also small power needed). In my use normal batteries have lasted for 100 to 150 photos and NiMh rechargeable batteries I have got 200 to 500 photos and the flash recharge time is about twice as fast compared to normal batteries.